The 2019 Volkswagen Jetta is completely new, from the ground up. Redesigned to improve comfort and spaciousness, this new Jetta also begins a return back to the car's original roots as a more precision driver with an upscale feel. In short, the 2019 Jetta is a big improvement over the previous-generation's somewhat lacking personality. The Jetta is now longer and wider than its predecessor with a much longer wheelbase and shorter overhangs. This improves handling and maneuverability as well as vehicle balance and interior roominess. Styling is more distinctive as well. Inside, a more contemporary, premium appeal has been added to the Jetta. What hasn't changed is the overall powertrain and the option for a six-speed manual transmission. VW enthusiasts will be glad for that. We also note that the fuel economy of the new Jetta is slightly better than before, despite gaining size and weight. VW enthusiasts will also be happy to hear that a sporty GLI variant is on its way for the 2019 Jetta, though it wasn't released at the time of this writing. 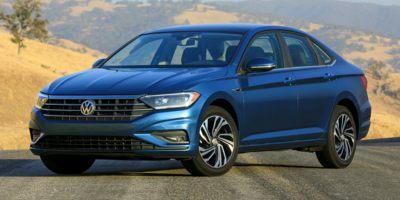 The 2019 Volkswagen Jetta is a compact sedan that seats up to five and comes in five trim levels. The engine and transmissions remain the same throughout the trim points and advanced safety systems are available at all trim levels. Everything about the 2019 Jetta's exterior is an improvement over the previous generation of the car. Stronger lines, a more well-defined curb presence, and more sportiness are all seen in this new rendition of the compact sedan. Most noticeable of the changes are the faster-paced hood creases, the stronger chisel to the bodywork, and the wider-appearing grille emphasized in chrome. The wheels being pushed to the corners improves the sporty appeal of the car as well. The grille for the 2019 Jetta is slotted horizontally with simple, straight lines that add character and emphasize the width of the opening. A thicker bar at the top and the VW marque in the center break this up a bit and help draw the eye along those grille lines to the rectangular headlamps with their sharp-pointed inside point. These three-part lamps give the Jetta a more upscale look up front. Hood lines are heavy and emphatic, drawing a bulge at the center of the hood and adding speed lines out near the fenders for a great look. The raked windscreen plays off of that with thin pillars and a strong emphasis on the body below. Body lines run from the top of the fender and wheel well to the rear taillamps, getting thicker towards the central pillar and thinning again towards the rear. Below that, a thick running board cut keeps the panels from getting too flat, adding more style. These lines mimic lines ahead of the front wheels, separating the headlamps from the fog lamp bezels. The clipped trunk and simple, but stylish rear deck finish the job. We like the hint of an integrated spoiler, the unadorned horizontal lines of the rear clip and bumper, and the fast pace of the coupe-like style from the rear window and widening pillars. 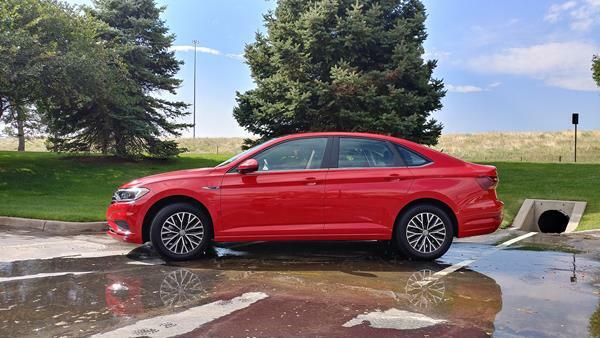 With good-looking wheels, a relatively tall stance above the ground, and a lot of promise of performance and handling, the 2019 Volkswagen Jetta has a great curb presence. The 2019 Jetta's interior is a big improvement over previous generations of the car. Materials quality is very good, but nobody would use the term "premium" or "luxury" to describe them in any seriousness. They are contemporary to the class, not exemplary, but are a big step up from the cheapness seen last year. What's most improved is roominess and accessibility. The new build for the Jetta means getting in and out of the car is a bit easier with slightly wider-feeling openings for the doors, including to the rear. The lengthening of the car means the Jetta has more step-in room while the wider body means a little more shoulder room and a lot more seat cushion. 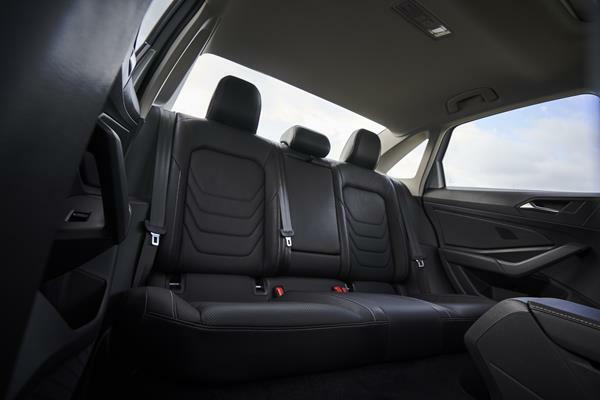 The front seats of the 2019 VW Jetta are comfortable and well-done, with plenty of short and long drive comfort. Adjustability is good as well and the driver is treated to a clear view of all controls with easy access to most everything. Storage is at a bit of a premium for gadgets and smaller gear, but is commensurate with what's usually found in the segment. We still enjoy Volkswagen's "function makes form" approach as this puts ergonomics first. The rear seating in the Jetta is better than it's ever been, with good outboard positions and good amounts of room. Things are cramped for taller or bigger passengers back there, but are better than many in the compact arenas. Headroom is good as well. The center position will be cramped for everyone but kids. Cargo space in the new Jetta took a bit of a hit with this redesign, but is still on par with the segment's expectations. The 2019 Jetta has 14.1 cubic feet of trunk space, about 1.6 cubes smaller than 2018, but has good access through a wide-opening and low trunk. The rear seats fold to add more space, a now-standard feature in the Jetta. The most striking improvement in the 2019 VW Jetta is in interior noise levels when on the highway. It's amazingly quiet for the price point at nearly all speeds. 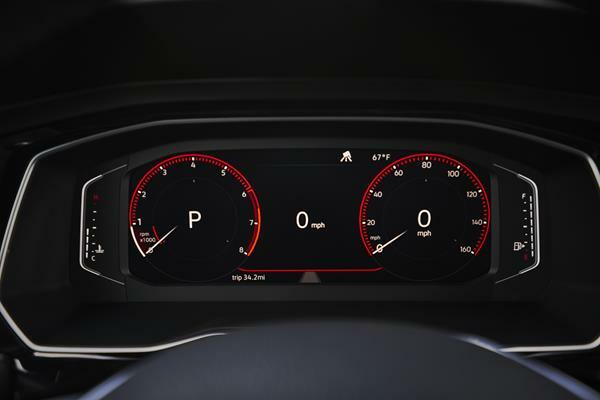 The fully-digital instrument cluster is easy to read in all situations and customizable for the driver's preferences. An excellent option. The 2019 Volkswagen Jetta comes standard with a 6.5-inch touchscreen, which is larger than even the biggest upgrade option last year. Also standard is MIB II infotainment, a rearview camera, a USB port, Bluetooth, CarPlay/Auto connectivity, etc. The upgrade option is to a bigger 8-inch screen, which adds navigation, VW Car-Net Services, and another USB port. Driver assistance features can include adaptive cruise control, lane keeping assistance, and blind spot monitoring. Safety systems are listed below. The 2019 Jetta is EPA-rated at 30 mpg in the city and 40 mpg on the highway when the automatic transmission is installed. Those numbers drop slightly with the manual transmission, but remain some of the best in the class for a non-hybrid car. 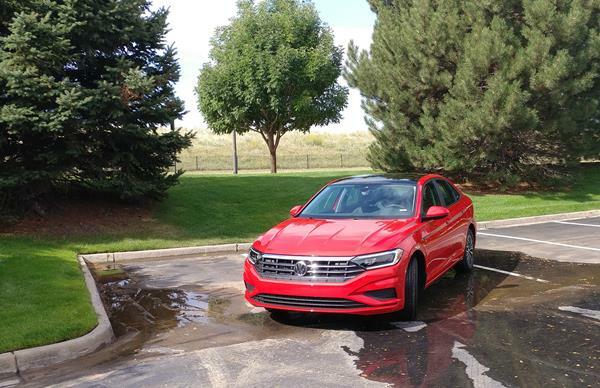 In our week with the 2019 Volkswagen Jetta with the automatic transmission, we averaged 33 mpg overall with a city-centric mix of driving. That's very, very good. Because the 2019 VW Jetta is all-new, there is little to go on for reliability predictions. The car has not had any recalls, as of this writing, and is backed by a very good 6-year/72,000-mile bumper-to-bumper warranty. Most Volkswagens score an "About Average" in the J.D. Power Vehicle Dependability Study and we expect the 2019 Jetta to do at least that well. Because there are no safety ratings for the 2019 Jetta this early on, our only metric is to look to previous generations of the car to make a prediction for its safety expectation. The Jetta has historically done well in crash testing, often landing as a Top Safety Pick from the Insurance Institute for Highway Safety (IIHS) and a 5-Star recipient from the National Highway Traffic Safety Administration (NHTSA). With added advanced safety measures and technologies this year, we think the Jetta will do well in crash testing. These systems include forward collision warning with automatic emergency braking, blind-spot monitoring, and rear cross-traffic alert. These are available as options in the base model Jetta and come standard on the other four trim levels of the Jetta. The 2019 Jetta features a well-vetted 1.4-liter tubocharged four-cylinder engine that outputs 147 horsepower. A six-speed manual or eight-speed automatic transmission are available in the lower trims with the automatic being standard in the upper trim points. This engine is a good match for the Jetta, if unspectacular. It feels good, drives well, and gets the car around without fuss. It doesn't inspire any feelings of speed or performance, however, just everyday competence. For most buyers in this segment, that's enough. We like the way the Jetta handles on the road, though, with its improved steering and better chassis feel. It's not tight or sporty, per se, but it is confident and engaging. The engine and transmission can make noise and struggle a bit when pressed hard for a pass or merge, but those sounds are short-lived and don't necessarily impact the confidence of the car's road appeal. No one will use the term "sport sedan" to describe the VW Jetta compact, but it can't be called "sluggish" either. The engine and transmission are smooth and do well on the road. The quiet ride on the highway is a surprise, given the VW Jetta's price point, but adds a lot to the appeal of the sedan. Maneuverability around town is also very good, thanks to those outflung wheels and sharp steering. 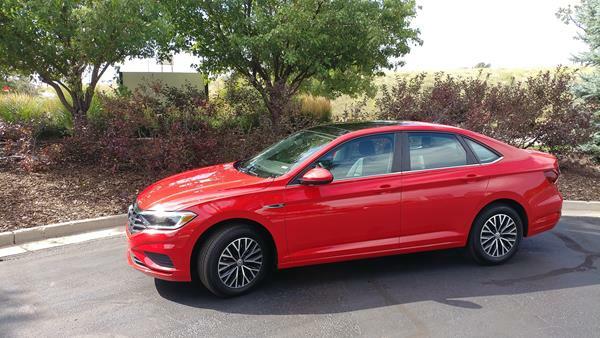 The 2019 Volkswagen Jetta is one of the lowest-cost sedans in the compact/midsize segments and comes loaded with features at its base level. Most buyers will be attracted to the second-tier SE or SE R-Line specs, which don't cost much more than the base model and offer a full suite of safety and interior amenities. Volkswagen is no doubt hoping to get the Jetta back on its feet after falling sales flagged the previous generation of the car. We expect dealership and manufacturer incentives to be high for the new 2019 Jetta, potentially making it a phenomenal deal for new car buyers. Pitted against the 2019 VW Jetta are some strong competitors in the compact market. The best-selling Honda Civic and the well-done Kia Forte are good comparables to the Jetta for refinement and styling. Against the Civic, the Jetta is not as fun to drive around town, but offers better interior appeal and highway noise reduction. Against the Forte, the Jetta is generally better in every way but interior comfort. Other rivals include the Toyota Corolla, which struggles to find a fit, and the smaller compact and subcompact crossovers that are entering the market and shaking up what can be expected of small vehicles. The 2019 Volkswagen Jetta is a mainstay in the compact sedan market. Strong competition from good offerings in the segment means that the Jetta sometimes seems less appealing, but this new generation of the car will help remedy that. With a solid set of base level amenities, a good price point, and an excellent overall dynamic, the 2019 Jetta is certainly far more compelling than previous generations of the car have been. Interested to see how the 2019 Volkswagen Jetta ranks against similar cars in terms of key attributes? Here are the 2019 Volkswagen Jetta rankings for MPG, horsepower, torque, leg room, head room, shoulder room, hip room and so forth.